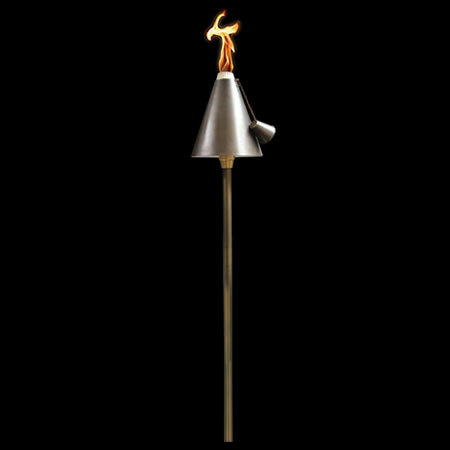 Whether you are lighting a BBQ area, deck or simply would like a decorative area light, this elegant brass tropical inspired torch and down light will help to create a beautiful resort right in your own back yard. Its removable wick assembly and threaded collar make the torch easy to remove and fill. The 35 watt Astro-Brite is protected from the elements. Its braided fiberglass wick will not unravel or blow out. As with all Signature Series fixtures the Islander carries a Limited Lifetime Warranty. Available in Copper. Crafted from extruded brass or copper. Brass or copper unibody design provides enclosed, water resistant wireway. Integrated bung for maximum mechanical strength. High temperature, double o-ring retention collar provides weather-tight seal. For use with a xelogen lamp up to 35W. FLEX™ Series LED lamps are available in 1W or 2W T3 lamps. LED lamps are available in 3000K color temperatures.